Our neighbors and friends Graham and Rhea went out of town last week and left Clare and I in charge of watering their garden. A risky proposition given our track record, but, fortunately, nothing catastrophic happened (aside from the installation of a satellite dish in the middle of the yard, but I don’t think we were to blame for that). In return for not raining a vegetative pox down upon their plot, we got to pick and eat what was ripe and ready, quite the treat in the middle of August. This is just the time in Wisconsin for that delicious treat, the Sungold Tomato. Small, round, orange and amazingly sweet, Sungolds, every year, make real for me the fact that tomatoes are fruits. Fortunately for me, my wise neighbors had planted a veritable host of Sungolds and I was transported. Using my greatest powers of restraint, I managed to usher the tomatoes home to safety without eating them, a trecherous ten yard odyssey, and proceeded to ruminate what I could make with these little globes of heaven. Geez, someone’s feeling like an ex-English major today. There’s a tomato farm in Brooklyn, WI, Tomato Mountain, that makes a bunch of sauces, salas and such for sale at markets with their produce and they make a Sungold Preserve. I thought first of them, but their preserve doesn’t really get my motor runnin’, if you know what I mean. So, I looked up tomatoes in Ferber and most of her recipes call for green tomatoes. She has one for ripe tomato jam with vanilla, but I just couldn’t get into it. It took me a while to do so, but I eventually settled on Tomato Peach Jam. Both are sweet, juicy and a bit musky. Good enough for me. And they make peach salsa right? So, what the hell. The next step was to draft a recipe. I didn’t want either flavor to dominate because they both have so much to offer. Interestingly, there’s a classic french tomato preserve using red tomatoes with cinnamon in it, but I didn’t want to add spices, herbs or influences for the same reason. So, I decided half and half tomato and peach would work. Ok, so I had my flavor profile in place and so I just needed to work out the texture. 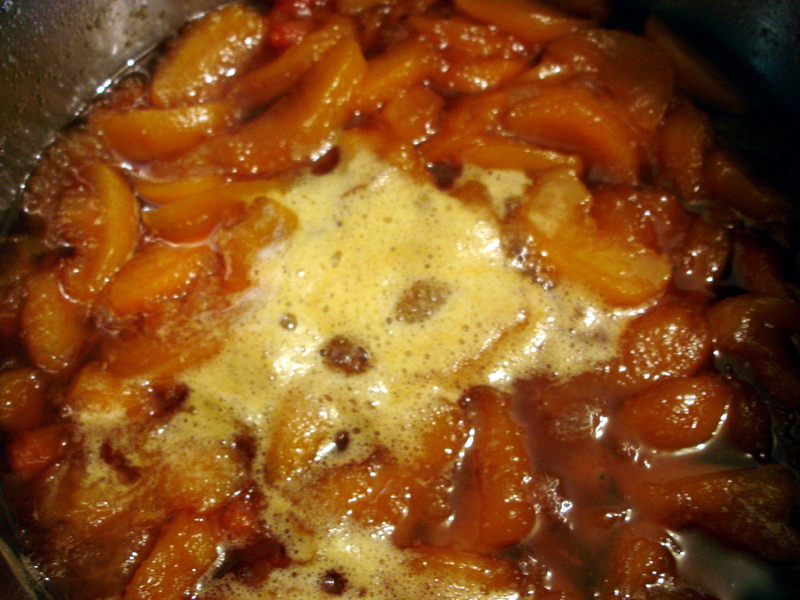 In both her tomato and peach jam recipes, Ferber calls for peeling and seeding the fruit. Ok, easy enough. 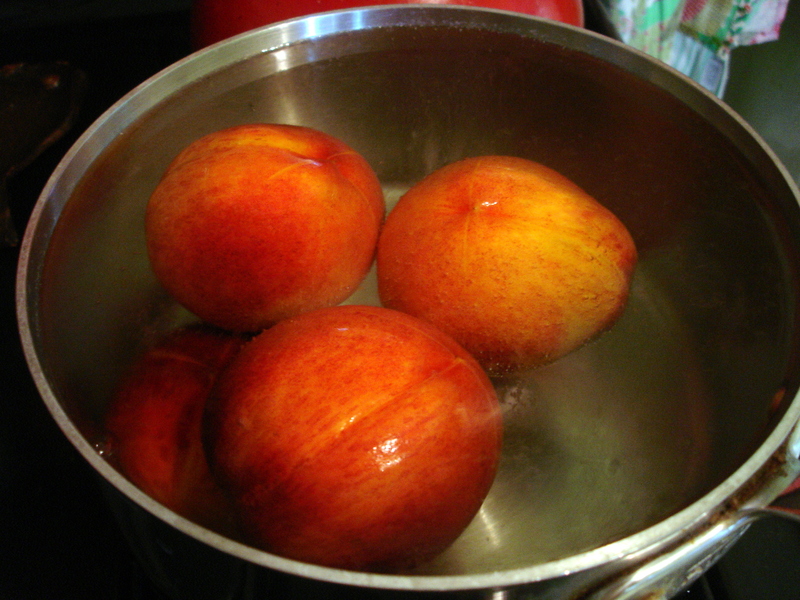 Peaches apparently have enough pectin to make a jam on their own, but not so much with the tomatoes. Her recipe calls for the addition of Green Apple Jelly to enhance the pectin content. So, I decided that I’d use half of what she called for in her tomato recipe in my tomato peach recipe. After a day or two of work, I had that all set. And with that, I had myself a proto-recipe, all you really need to get the process of trial and error moving. The first step was to peel the peaches and tomatoes. To do this, you need to score the flesh, blanch the fruit for just a few seconds in boiling water and shock it in ice water. 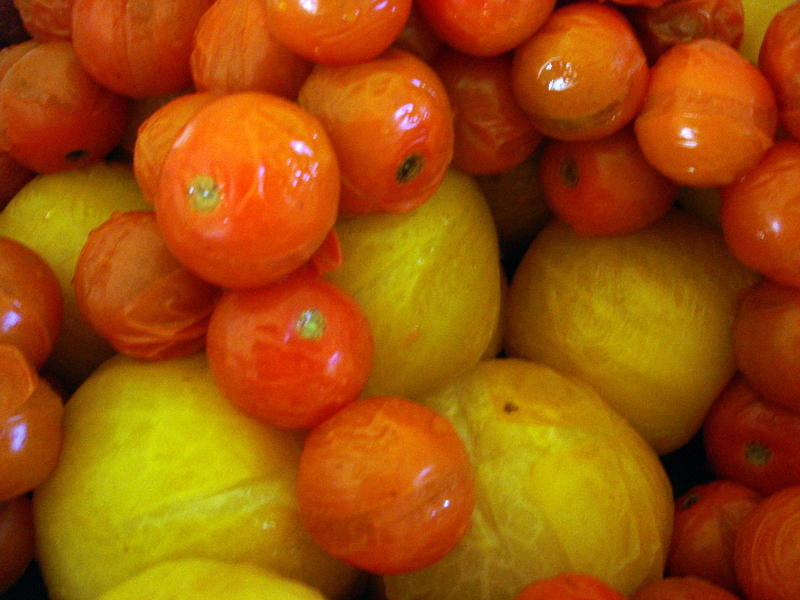 In the tomatoes, the skin wrinkles and the flesh softens, allowing the easy removal of the seeds. As you can see, I used both Sungolds and a meduim sized tomato called Taxi to bulk up jam. I peeled and seeded everything, cut the peaches into sections, mixed the fruit with sugar and lemon juice, put it into the ceramic bowl that is getting the greatest workout of its life this month and let it sit overnight in the fridge. On day two, I brought the whole mix to a boil and reduced it until it started to take on the proper consistency. At this point, I added the apple jelly/pectin stock and kept simmering until it set up how I wanted it to. I canned it and let it cool on the counter. The resulting jam is unique but I really like it. It’s not so much a breakfast with waffles jam. It plays better with a robust baguette or sourdough and some good cheese. With the tomatoes, it is certainly bridging the savory sweet gap and it needs to be used as such. if y’all are hanging out on labor day, bring some for a taste test! maybe it will be good on a brat… ew? We’ll be there and I’ll bring some jam with some appropriate cheese and bread! however, blech. i try to be an open-minded lady, but the sweet-savory flavor combo does not trip my trigger. especially i knew i would not like the tomato plus sugar. it’s hard to say if it’s mental, though, because if i think about it i like ketchup and spaghetti sauce, both of which have sugar. but less sugar! and tomato peach salsa! i think it needs less sugar, and to be less a “jam” than a “spread” or “chutney” even. even mentally, that would be better for me. i wonder what other people will think of this one, maybe it’s just me? if I were to use pectin instead of green apple jelly, how much do you think I would need?